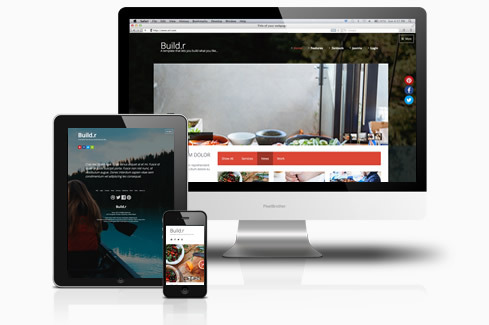 Build.r is a powerful and flexible all in one package that gives you the ultimate freedom when it comes to creating layouts and designs for your Joomla website all from a powerful and intuitive user interface. 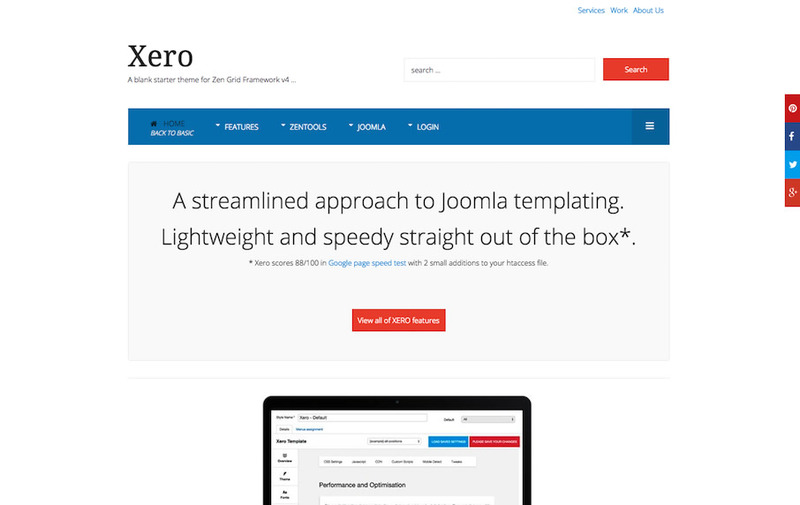 The Xero template is our first Joomla template to be built on the Zen Grid Framework v4 (ZGF4). Our new framework has been built from scratch from the ground up to yield some truly amazing results in providing powerful and fast tools for users to build fast and feature rich responsive websites built with Joomla 3+. Xero features an array of tools to help create the fastest experience for your users out of the box. Compress, Gzip, use CDN's and more to make your website blisteringly fast. Xero features extensive tools for controlling your website across various screen sizes. Choose from five different behaviours for responsive navigation, easy access to template breakpoints, built in support for php mobile detect and more. Xero features an extensive list of theming tools to help tweak colours and layout variables used in the template. It's built in less compiler quickly and easily processes any changes. Bootstrap is not required for the Xero template to operate with basic Joomla content views however if you need Bootstrap you can use our selective implementation tool to add the various required bootstrap elements to your design. It's easy to add your required bootstrap elements without adding the entire bootstrap library. Easily create and control your layouts using our draggable layout tool. It's easy to get a visual representation of your site's layout via the layout tool which allows you to hide publish and control modules with an easy to use draggable inetrface. Beautiful fonts are just a click away. This theme makes it very easy to add any of the fonts found on the google font directory. Just add the name of the font to the administrator panel and let the template do the rest. This template is optimised for use with Zenkit - our flexible responsive templates that effortlessly transform your K2 content. Easily apply a slideshow, accordion, grid, carousel, magazine or blog layout to your K2 content. Zentools makes it super simple to use your Joomla / K2 content, or images from a folder to create responsive slideshows, carousels, accordions, grid galleries and more. Featuring a drag and drop interface and intelligent admin panel Zentools is a popular choice for site builders and developers alike. Xero also features a range of menu tools for creating dropdown, vertical, accordion and offcanvas menus. The Zenmenu plugin makes it possible to add icons, subtitles and multi-column menus to any core Joomla menu module. You can easily add fancy fading, sliding and bouncing affects to entire rows of your content using the built in css3 animation tool. Adding animations to your Joomal template has never been easier. Xero also offers the ability to connect your site to your social networks. Add social sharing for facebook, google plus, pinterest and twitetr at the click of a button. Xero also features the ability to create a simple one page smooth scrolling design. One page make it possible to use your main navigation to scroll to specified anchor points on your page. One page mode works perfectly on mobile devices via the offcanvas or toggle menu options.